The M4 Sherman tank was the most important tank in the US inventory during World War II. 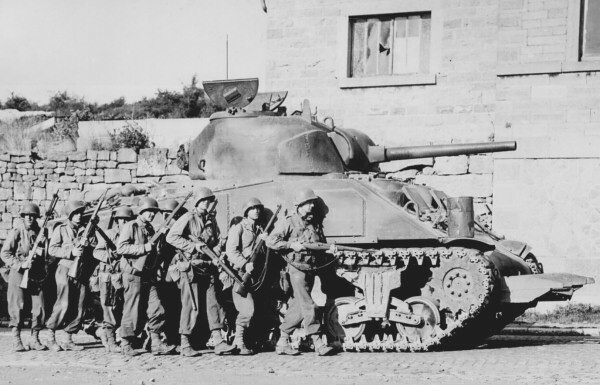 It certainly wasn't the best tank in world-wide service, but because the US accepted it as its standard combat tank and all industry was geared toward the mass production of it, the Sherman served in very large numbers both with the US military, and to a smaller degree with our allies. Given the importance of this vehicle, one would think that it would be one of the most popular subjects for model builders, but that is far from being true. Until very recently, the available selection of 1/72nd scale Sherman tanks was woefully pathetic. Only in the past year or two have we finally been provided with a large selection of high quality resin and plastic model kits, and thankfully, new versions of this most ubiquitous tank continue to be released fairly regularly. I want to put to rest any sort of belief that "a Sherman is a Sherman is a Sherman ..." If you talk to a modeler who specializes in WW II German subjects, he can probably tell you the difference between a Panzer IV that was built during the third weekend of March 1943, and one that was built two weeks later, and yet he would maintain that all Shermans look alike. Hogwash. There were many variants of the Sherman tank, all of which had very distinctive features. Writing an article "about the Sherman tank" is similar to writing an article "about the Panzer IV". There are so many different variants of the vehicle that fall under the heading of Sherman tank that any such article is by necessity going to be long, convoluted, and with the case of this author, probably riddled with omissions and outdated information (I'm trying to minimize this...). In order to try and be all-encompassing, and yet still manageable, I plan on producing this article in a "modular" form, which will allow me to make frequent updates, changes and additions, as new information comes my way. This article is going to have a lot more background information on the vehicle than have most of my previous articles, simply because this information is needed in order to properly compare and contrast the different model kits of the Sherman tank that are available to us today. There are a large number of very fine reference books available for the Sherman, and I am not going to repeat verbatim all of the material that I have collected over the years, nor copy anything that is copyright protected. Instead, I wish to summarize many of the detail differences between the numerous versions of the Sherman tank, and tie these into the lists of available kits in this scale. Going back to the comparison I previously made between the Sherman and the Panzer IV, one will see many similarities. Like the Panzer IV, the Sherman tank came in several different versions, and these versions are very different from one another in many ways, yet very similar in others. In addition, specific features seen on individual vehicles can make it possible to estimate rough dates of their manufacture. Within the framework of describing the different versions listed above, we can also categorize the Sherman versions based on chronological characteristics. Shermans are often described as being "early" or "late" versions, but these are arbitrary designations that may refer to one of several different characteristics. There were two primary calibers of cannon used on the Sherman tank: the 75mm and 76mm guns. The turrets in which these guns were mounted were different; the 75mm tanks were the first, or early version, and the 76mm were the later version, and were produced after the 75mm tanks (though the 75mm tanks continued in service throughout the war). There were two additional, less common, armament options: a 105mm howitzer, and the British 17pdr cannon. Both of these guns were mounted in the same turret as the 75mm gun, and likewise saw service to the end of the war. Another method of grouping the Sherman variants by date is by the shape of the hull front. There were two basic shapes. The early version had a 56° slope to the armor, small crew hatches, and distinct bulges in the front armor plate for the crew positions, which were known as the armored hoods. The late hull style had a 47° slope to the hull (with thicker armor) and larger crew hatches that opened at an oblique angle. For the welded hull versions (M4, M4A2 and M4A3), the armored hoods were eliminated completely in the late version hull giving a completely smooth front armor plate, and for the cast-hull M4A1, the bulges were reduced significantly leaving only small bumps in the front armor. The late hull is often referred to as the big-hatch hull, and the early version as the small-hatch hull. Generally speaking, the changeover from the early to the late hull occurred at the same time as the changeover in armament, from the 75mm to the 76mm turrets. There are some exceptions that will be detailed later, but for the most part, it was the 76mm turrets that were seen paired with the late hull style. Only the 75mm turrets were mounted on the early hull style. The change in hull shape also coincided with the changeover from ammunition dry stowage to wet stowage. Early Shermans stowed their cannon ammunition in bins within the hull sponsons (where the armored hull overhangs the wheels and tracks). This arrangement led to many ammunition fires when the tank was hit, and a redesign was needed to save tanks and and their crews. The later version hulls switched to stowing the ammunition in storage bins beneath the floor of the fighting compartment, and the shells were covered with a solution of water and anti-freeze, hence the term wet stowage. A very few of the late version 47° hulls retained the dry ammunition stowage in the sponsons, and can be identified by the appliqué armor plates that were either welded or cast into the hull sides to provide additional protection for the ammunition. But for the most part, the changeover to the 47° hulls was the same time as the switch to wet stowage. So three major changes occurred at approximately the same time: the change from the 75mm M4 turret to the 76mm T23 turret, the change in front hull shape from 56° to 47°, and the change in ammunition stowage from dry to wet. This means that in a very broad sense, we can categorize early Shermans as those with the 75mm turret and the dry-stowage, 56° hull, and late Shermans are those with 76mm turrets and the wet-stowage, 47° hull. Again, we will see several exceptions to this scheme in the coming pages of this article. There were also other "minor" detail changes that can be used to date a vehicle, such as the shape and construction of the nose (final drive housing), the presence or absence of the direct-vision slots on the 56° hull front, and the presence of a commander's cupola or loader's hatch on the M4 turret. None of these changes was tied to any specific variant, but are rather a function of the date of manufacture. The official vehicle designations were developed to reflect some of the specifics of the version being discussed. For example, when the armament was changed from the 75mm gun to either the 76mm or 105mm, this change was added to the designation as follows: M4A2 (76), or M4 (105). Also, if the hull was the late style hull with wet stowage, a "W" was added at the end of the vehicle designation like so: M4A2 (76)W, or M4 (105)W.
When the armament changed, they added another letter to the end of the designation: A for the 76mm Cannon, B for the 105mm cannon, and C for the 17pdr. So an M4A1 (76)W was called Sherman IIA, and an M4A4 armed with the 17pdr was called a Sherman VC (also known as Firefly).